Consumers should know the facts when it comes to buying a Cold Climate Heat Pump (CCHP) and whether it will help save money heating their home. 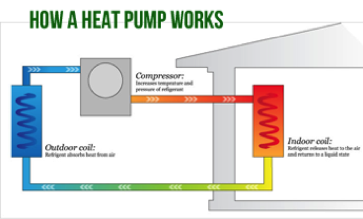 An electric Cold Climate Heat Pump (CCHP) works best in open construction one-story homes. They do not heat the whole building, only the rooms where the appliance is located. While a CCHP will displace, it doesn't replace. You still need an oilheat or propane fired central heating system operating in the winter to ensure your pipes don't freeze. When pipes freeze up they can crack and cause significant damage. One freeze up with broken water and/or heat pipes can cost more than $10,000 to repair. If used properly, a CCHP will reduce consumption of fuel used by a central heating system, much like a wood stove. And similar to wood heating, the displacement of fuel is highly variable. Whether this displacement “saves money” is entirely dependent on the efficiency of the central heating system and the price of the fuel that is used by the central heating system. According to the Cadmus Group which performed an Evaluation of Cold Climate Heat Pumps in Vermont, the economic payback is more than 12 years. While there is a savings of around $17 a month in energy costs, that is negated by the cost of the unit. A majority of homes in Vermont are heated with hot water or steam, thus lacking the duct work necessary for a central air conditioning system. In fact, according to the 2016 survey conducted by the UVM Center for Rural Studies, less than 10% of consumers in Vermont purchase CCHP specifically for heat. They want a heat pump for air conditioning. Consumers that use a CCHP for heating often complain that it does not provide the same warmth and comfort as a central heating system. Heat pumps circulate air that feels relatively cool. Unlike a furnace which blasts hot air for a few minutes and then turns off, heat pumps run longer at cooler temperatures. If the air temperature being supplied from the CCHP is below skin temperature, there will be a perception of being cooled, especially when there is a velocity of air across the body. When supply air temperatures are at or below typical body temperature (slightly less than 100 degrees Fahrenheit) consumers report feeling cool and uncomfortable. This is reflected in research using the U.S. Department of Energy simulation tools (BeOpt and EnergyPlus) to quantify comfort level associated with various heating sources. Supply air from CCHPs is colder than 100 degrees Fahrenheit 65% of the time. The resulting discomfort may cause consumers to rely more on the central heating system. A study released by the Consortium for Advanced Residential Buildings (CARB) further addressed the uncertainties about the capacity and efficiency of CCHPs in cold weather (Exh. VFDA-7). According to the report, “these uncertainties could lead to skepticism among homeowners; poor energy savings estimates; suboptimal system selection by heating, ventilating, and air-conditioning contractors; and inconsistent energy modeling.” The report goes onto to state that "the results from this monitoring effort show a wide range of performance with many systems performing below expectations. More work is needed to better assess energy consumption and capacities of these systems in different climates and home configurations." At what point does electric heat from CCHP cost less than heating oil or propane? 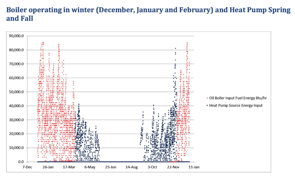 Using data from the Emera Maine Heat Pump Pilot Program conducted by EMI Consulting, the installation of a CCHP is assumed to displace 239 gallons of heating oil a year. The displacement of 239 gallons at $2.30 per gallon results in $549.70 a year in savings, less the projected additional annual electric use for the heat pump in the heating cycle of 2,387 kwh @ $0.16 equals $381.92. 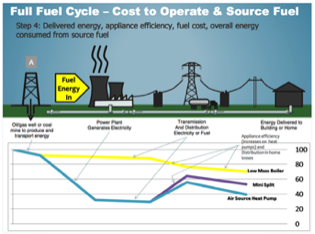 This savings amounts to $167.78 per year in thermal energy costs. However, when you add a typical utility lease payment of $660 per year, the average customer would lose $492.22 per year, or $7,383.30 over the life of the lease. The cost of heating oil would have to be in excess of $3 a gallon and electric prices must remain constant during a 15 year lease for there to be any savings under a typical utility lease program. What are the other factors beyond the price of competing fuels? 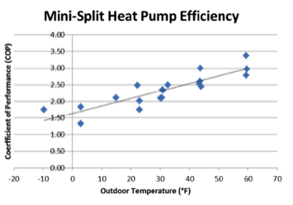 The United States Department of Energy Buildings Technology Program Laboratory Test Report for Fujitsu 12 RLS and Mitsubishi FE12pA Mini-Split Heat Pumps. In the report they determined the coefficient of performance for two popular models of CCHPs. The results are expressed in the following graph. Note that as the outdoor temperature drops so does the efficiency of the CCHP. This is just the opposite of the efficiency of oilheat and propane fired central heating systems. As it gets colder the idle losses drops and the efficiency of oilheat and propane fired heatings systems improves. The colder it gets, oil and propane systems become more efficient. Using this performance data, Brookhaven National Laboratory (BNL) developed an 8,760-hour model of a 2,500 sq. ft. Maine home. It compared an oil fired non-condensing boiler (that also heats domestic hot water) with a Two-Head Mini-Split 38,000 BTU Heat-Pump. The study looked at 3 modes of annual heating operation: Oil fired unit only, CCHP used in shoulder months, CCHP used all winter long. BNL found the CCHP output dropped from 100% at 60 degrees Fahrenheit to 45% at zero and 35% at -10 degrees Fahrenheit. The coefficient of performance (COP) was 1.7 at zero, 2.5 at 30 degrees Fahrenheit, and 3 at 48 degrees Fahrenheit. The study concluded that that while a CCHP is more efficient than oilheat at and above 48 degrees, oilheat is more efficient than a CCHP when temperatures dip below 48 degrees Fahrenheit. 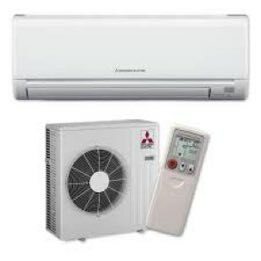 Electric heat pumps keep you cool when it is warm, and they keep you warm when it is cool. But when it is cold....not so much. pipes are at risk of freezing if the homeowner does not have a central heating system. to download testimony from VFDA before the Public Service Board regarding electric cold climate heat pumps.